The Life Fitness C1 Upright LifeCycle is the base model in the popular exercise bike series, offering the smooth ride and solid feel of the health club version at a more affordable price for the home gym. With two console choices, plenty of resistance levels, comfortable seat and a variety of built in workouts, this is a great choice for those who want an affordable, easy to use commercial-grade exercise bike. The LCD display has readouts for time (remaining, elapsed, in zone), speed, distance, pace, heart rate, target heart rate, calories, and more. The basic programs are Manual, Hill, Random, EZ Incline/Resistance, Sports Training™, and Quick Start. Programs on the advanced console include additional heart rate, intervals, race, and goal workouts. Check out the C1 Lifecycle on Sale Now at the Life Fitness Store! 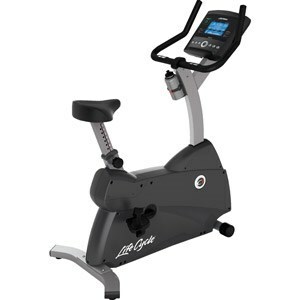 As we mentioned, the Life Fitness C1 Upright LifeCycle is the entry level model, but that doesn't mean it is lacking in features or capabilities. It looks and feels just like something you might see at the gym. There is also a recumbent version called the R1 if you're looking for a seated model. It features an ultra-smooth eddy-current resistance system that is maintenance-free and very reliable. You get 20 different resistance levels to choose from, so you can challenge yourself from one workout to the next. Speaking of challenge, there are 12 built in workouts and 2 custom programs on the base Go console, and 16 workouts with 12 custom on the more advanced Track Connect console. The latter costs about $500 more, but it has the ability to connect to your smart phone or tablet for workout tracking and app integration. It also gives you two additional user profiles. The Life Fitness C1 features contact hand sensors for heart rate monitoring, well cushioned seat and self balancing pedals. There's a maximum user weight of 300 lbs. 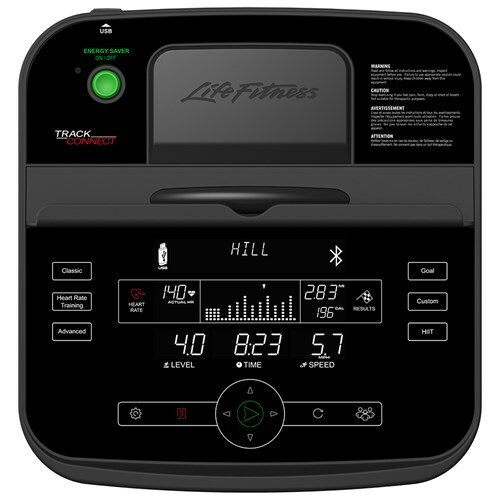 Most customer reviews on the Life Fitness C1 mention the incredible attention to detail in its mechanical design, as well as the quiet, smooth ride. With 14 different adjustment points on the seat and racing-style handlebars that encourage good riding posture, this is one of the most comfortable stationary bikes you’ll find on the market. Some of the creature comforts include a front-mounted water bottle holder, and a built-in integrated reading rack. The main selling point of the C1 is that it is more compact and lighter than the other upright exercise bikes in the series, so it's easy to move around. It's also the most affordable option the company offers. Because of these reasons it will continue to be one the more popular choices and best sellers for the company. How Does the C1 Compare to the Other Life Fitness Upright Bikes? As we mentioned, the C1 is the base model, so it doesn't have all of the features and capabilities of the higher priced models. Still, it's a solid choice if you are looking for a club quality machine. Many people ask about the C1 vs the up-level C3, and the only real difference is the C3 has more advanced cushioning and upholstery, and a 400 lb. max user weight capacity as opposed to 300 lbs. on the C1. So the C3 is a bit more durable and can handle more usage than the C1. if you don't need the additional comfort and higher max weight, the C1 is perfectly fine. What about the Club Series + and Platinum Club? Those two uprights are even more commercial grade and essentially the same as you would find at the health club. The Club Series + Upright is one of the newest models in the series with a sleek, modern design and a touch screen display, as well as an additional 5 resistance levels. The Platinum Club Upright is the top of the line exercise bike, with four frame color choices and three console options, along with a number of enhanced features. 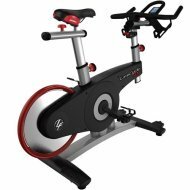 Note that the Club Series + and Platinum Club are more than twice the price of the Life Fitness C1 upright, so unless your budget is wide open, you'll be better off with the C1 or C3. We definitely recommend the Life Fitness C1 Upright LifeCycle as a great option in the higher end segment of the market. It's more affordable than its nearest competitor, the Precor UBK 615, a comparable bike feature-wise that's about $1000 more expensive. Also take a look at the Matrix U30, one of the newer entries in the market that's really gaining momentum. It features a compact design, unique programming and 3 different console options. The C1 is a gorgeous machine that has precision engineering, a heavy-duty welded steel frame, and a comfortable seat with correct positioning for height and distance to the pedals. It’s smooth and reliable, just what you expect from a LifeCycle, the number one brand of exercise bike in health clubs worldwide. If you think you need something even more durable, check out the up-level C3, or one of the Club Series uprights if your budget is more open. Again, you can't go wrong with any Life Fitness exercise bike. Everything they make is rock solid.